Inside My Studio: Mohair to Dye for!! I spent last night dying some deliciously dense white Schulte mohair, both straight and curly. I had fallen in love with both of these extra dense white mohair qualities and found that Edinburgh Imports was not carrying them any more, unless I wanted to do a special order and get five yards---so of course I did! 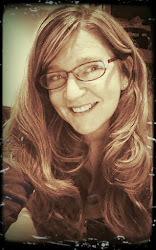 I have such fun dying mohair, but I make such a mess of my kitchen in the process. No worries though, because it all cleans up. The purple and green colors are inspired by this bit of loopy trim I purchased at Hobby Lobby, and the red and blue are for a patriotic bear (I know I'm late for the Fourth of July holiday, but, hey, I can still be patriotic! 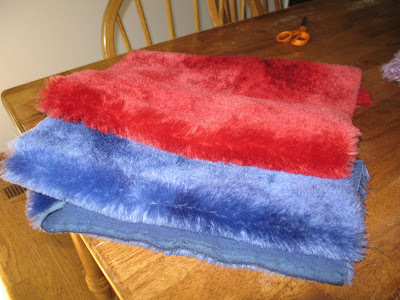 )I used Rit dyes, Scarlet by itself for the red, Denim Blue and Royal Blue mixed for the blue. 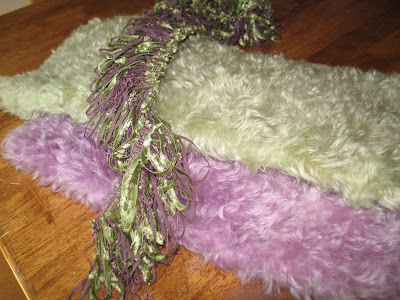 The purple and green colors were mixed by adding a little of this and that to Kelly Green and Purple. Color wheel knowledge comes in handy when dying fur. Did you know that if you wish to tone down the brightness or intensity of a color you can just add a little of it's color wheel opposite? Fun stuff!! Now off to make some bears with those lovely furs!